KGR Drifter Bits Manufacturers are amongst the heading associations, occupied with assembling, sending out and supplying an extensive and qualitative reach of Drifter Bits. To finish the genuine necessities of customers, we hold mastery in giving customization results. This further empowers us in securing huge backings of the customers, which are based over the world. We are the makers, suppliers and exporters of Drifter Bits. 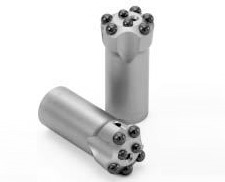 Our Drifter Bits Manufacturers are regularly accessible in two sort’s level face and drop focus. The string types of our Drifter Bits differ from R22 to R38, T41 and T51 and the measurement 1 3/4 inch to 3 inch. Our extent of wanderer bits fluctuates from diagram 39 to 140mm. We produce Drifter bits in two face styles (level and drop focus) additionally in well known string forms (r22 to R38, 1 and T51). The Shank styles are likewise of two sorts (straight and retract help our clients, Drifter Bits Manufacturers have presented DTH Bits. Offered extent is outlined & created utilizing most recent innovation, so results offered must be immaculate in utilization. We make our conveyances in an advantageous system according to the customers' details. Drifter Bits Manufacturers are instrumental in offering a complete extent of Drifter Bits (Item Code :bi15252) that is exceedingly praised for their gimmicks like vigorous development, longer practical life and high quality. Additionally, our items are accessible at moderate costs and are in consistence with industry standards & guidelines.